Go into the app store today and you might be in for a spooky but not unpleasant surprise – there’s an official Stranger Things game lurking there. Given that the second series of the TV show is coming to Netflix on October 27, the timing is apt and considering it’s free and there are no in-app purchases to contend with the game is obviously promotional in intention. That’s not necessarily a bad thing, though. 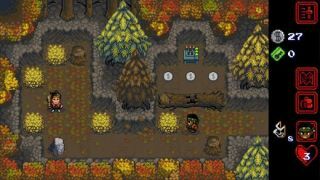 Effort has clearly gone into Stranger Things: The Game and the 80s influence that permeates the TV show is absolutely present in the game, with 16 bit visuals that are definitely inspired by the RPG adventure titles of the period. It's almost like Netflix knows tugging at our nostalgia is an effective tactic. As far as gameplay is concerned, you’ll find yourself solving puzzles using abilities unique to all of the show’s collectible characters. Nancy can, for example, swing a bag of bats around while Hopper is great for punching out a solution. There are lots of collectible Eggos and Gnomes scattering the game world and a VHS library to fill. If you check off all the game’s achievements you might, apparently unlock never-before-seen-footage of season 2. Given that’s coming at the end of this month and there's around 10 hours of gameplay, 7 playable characters to choose from, 6 Dungeons and over 30 quests here you’ll probably want to crack on. According to the game’s official blurb, those born after 1984 “might want to start with Normal difficulty” to explore a their own pace. Those used to the excruciating difficult of games from the 80s, though, will be drawn to the “soul-crushing” classic mode. A nice touch is that Netflix and the developers aren't planning to abandon the game after the second season of the show premiers. In fact, when the new episodes go up, the game will be updateds with new content and characters. Stranger Things: The Game has been developed by Texas studio BonusXP, Inc. and published by Netflix. You can download it for free on Google Play or iTunes right now.